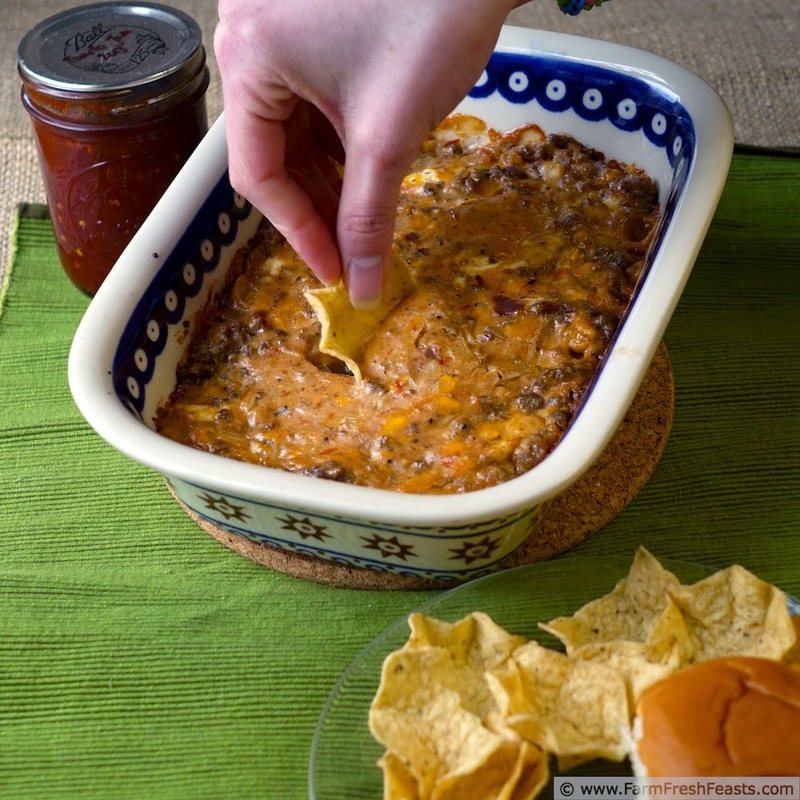 Hot, hearty, cheesy, beefy--I've unpacked the adjectives for this dip, but the name pretty much says it all. 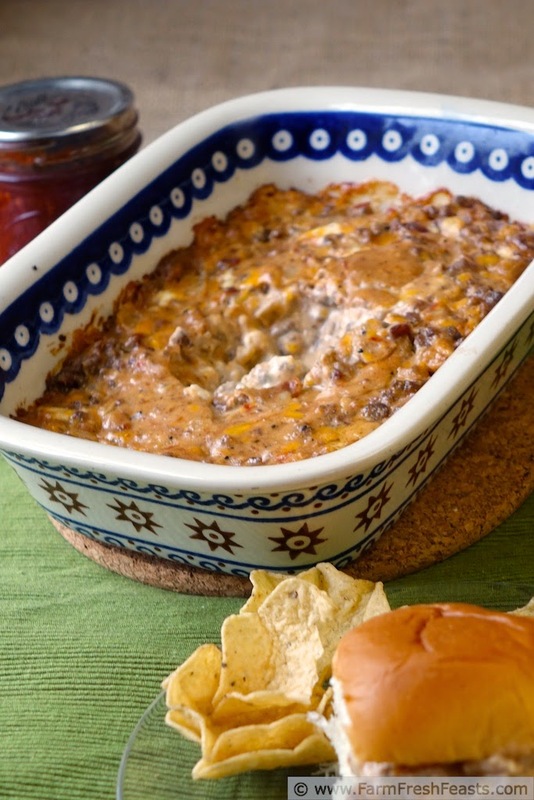 It's a bacon cheeseburger dip using tomato jam to provide some bold summery flavor in winter. Why is it that there's a big eating event in the dead of winter? Sure, sure, Thanksgiving is generally after a frost, but most of the Thanksgiving vegetables lend themselves to long storing or freezing. I'm talking about walking into 3 different grocery stores in 2 days [yes, I get around] and being assaulted with goal posts surrounded by mounds of fresh tomatoes and peppers and avocados. That ain't right. Fresh tomatoes, everywhere on the mainland US that I've lived, don't taste very good in the dead of winter. It's almost criminal to tantalize shoppers with the prospect of fresh vegetables when the flavor doesn't back up the promise. I turn to preserved tomatoes (those that I've canned, slow roasted and frozen, or jammed) for my winter time tomato flavor. I'll happily buy a jar of salsa [or crack open a jar of strawberry salsa] but make fresh tomato salsa from the store stuff to eat during the game? Not happening. Not now. I will GORGE myself on fresh tomatoes from July-ish through October-ish, but then I put up as much as possible so that I can enjoy these summer flavors in winter. Here's another way I use my preserves. If you're watching the game in shorts and a t-shirt, this recipe may not apply to you. While I like my room temperature snacks, our TV is in the basement along with the Strategic Winter Squash Reserve and I need something to keep me warm while watching. Sure, sure, having 2 to 3 dogs piled on my lap [occasionally tap dancing on my hard cider-filled bladder] does provide an extra 120 pound layer of insulation. However, it also prevents me from getting up to pee get refills of this savory dip. I suppose that's a form of portion control. You can see a quick pic of us on my FB page. 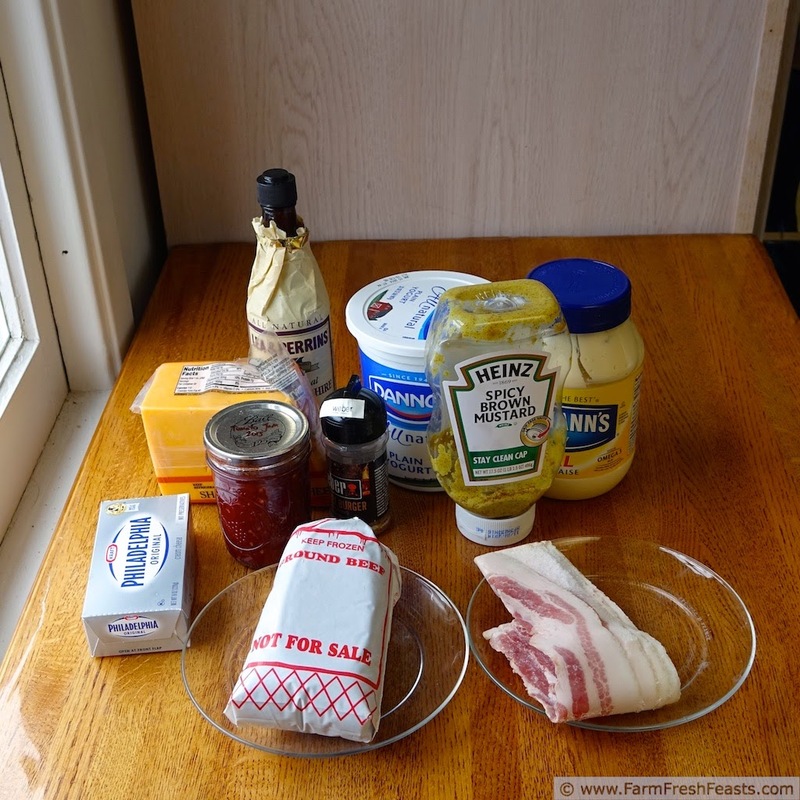 I made this dip last year* after being inspired by the Bacon Double Cheese Burger Dip at Closet Cooking. I thought that using some tomato jam (from Marisa's recipe at Food In Jars) would provide a bit of bold spicy sweetness to play off of the bacon, so I got busy with some of the cow that lives in my freezer. This recipe works both as a dip for a sturdy tortilla chip and a filling for a slider bun (those pictures did not turn out as well though). For other recipes using ground beef, please see my Ground Beef Recipe Round Up, 106 recipes from a whole host of food bloggers covering a variety of eating styles and categories [though there are no desserts using ground beef in this round up. that's icky to me]. Need a hot vegetarian dip? Try my Baked Artichoke and Arugula Dip instead. Preheat oven to 350 degrees Fahrenheit. In a large skillet over medium heat, brown ground beef and cook onion alongside, in the drippings, until softened (approximately 8-10 minutes). Stir in Worcestershire sauce and hamburger seasoning, then set aside. 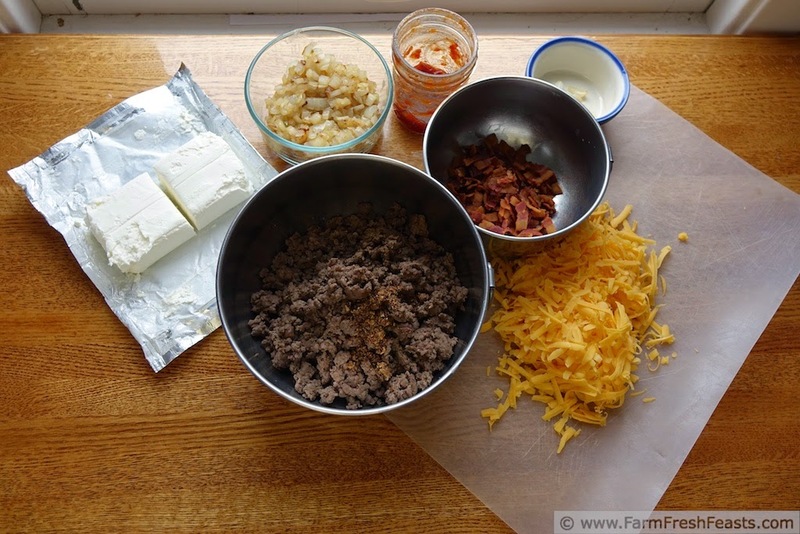 In a large bowl, combine beef mixture with mustard, cream cheese, sour cream, garlic, mayonnaise, 1/2 cup shredded cheddar, all the mozzarella, tomato jam and bacon. Transfer to an oven safe casserole dish (1½ quart is sufficient), and sprinkle top with remaining cheddar cheese. Bake at 350 degrees Fahrenheit for 30 minutes. Serve with tortilla chips or on slider buns. *You can tell that these photos are old because that lovely Polish pottery casserole dish shown is no more. Robert Barker was feeling quite peckish the other night. The crazy thing was that I didn't even hear the crash when the dish fell. I woke up to our Original Dog, Simon, coming upstairs to alert me that the new dog was getting up to shenanigans. I'm not sure if Simon snacked first before coming to tattletale or what. 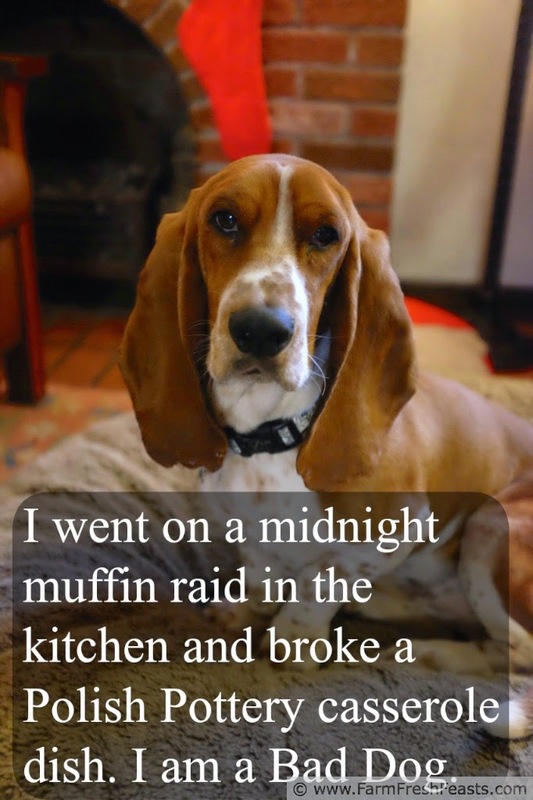 Dogs--gotta love 'em. And walk them. And scoop their poop. 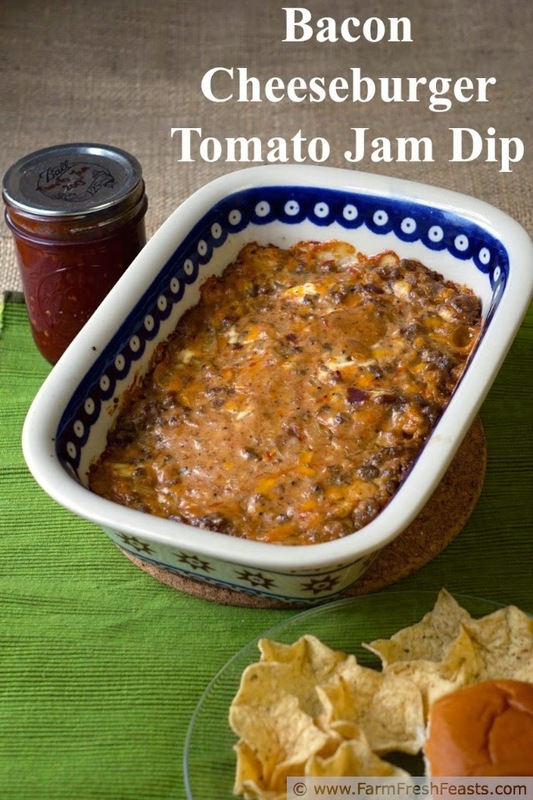 There are so many delicious things in this dip i don't know where to start. I love the idea, and tomato jam?? Awesome. I was desperate for ideas when I found Marisa's tomato jam recipe--I'd already canned a couple dozen quarts of crushed tomatoes and the garden just kept producing. Tomato jam on a ham sandwich is sublime. You are so right about tomatoes, yet I still torture myself! I'm going to stop the insanity. 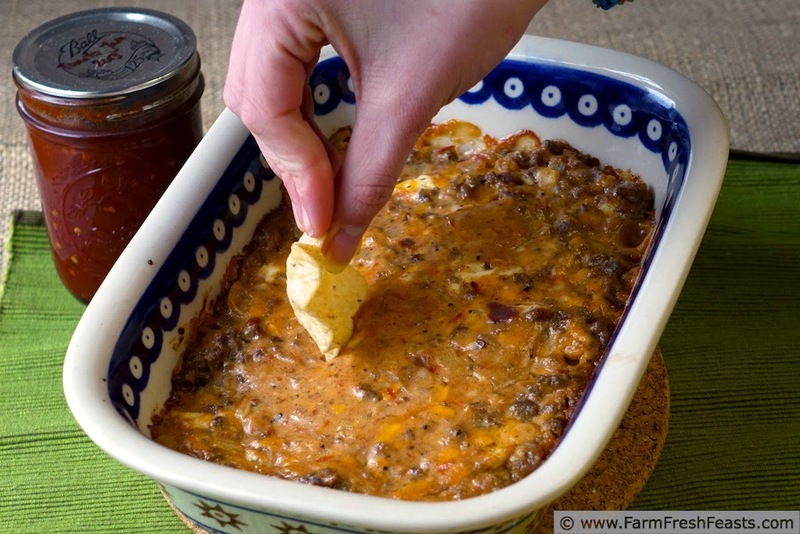 There's so much deliciousness in this dip! And I love the addition of tomato jam. I torture myself with berries now and then because they look so good in the store . . . and it's never as good. Yet I keep on doing it. You'd think I'd learn. Oh no, it was such a beautiful dish too. Poor Robert Barker. I started using my canned tomatoes the past couple of weeks. I bought some at the store the one day for a Minestrone Soup and thought wait, what the hell am I doing. I've got all those tomatoes we canned. So much better. That a girl! I've got quite the collection of empty quart jars on the counter that I need to move to the basement, but there's still enough in the pantry that I'm not hoarding them. Yet. I'll get to that point. I also froze a bunch of roasted tomatoes . . . maybe because it wasn't that hot? Did I not have enough jars? I have no idea why at this point, but I've started to use them as well. The stinginess will happen in perhaps March or April. I'm salivating looking at this dip after having gobbled up a handful of chips without dip. I'm not waiting for SuperBowl Sunday to recreate this. I've been salivating over oatmeal lately, which is really weird for me, but I'm going with it since a craving for oatmeal can't really be that bad for you. I'm delighted that the kickoff is at dinner time so I can just sit and stuff my face during the commercials. We are totally making this for Super Bowl tomorrow. YUMMM. I hope it turned out well--that was a terrific game! There's no need to stop at one bite, though the rest of the snackers may have issues with you if you hog the whole bowl. We've taken to serving ourselves smaller bowls of whatever dip just to keep the peace. Awesome dip Kirsten! I can just see you all watching that game. Naughty Robert with the Polish Pottery. So I could seriously do some damage with this dip. Yum. This is such a fun dip to make and to gobble up.